Subject: - Grant of Dearness Relief to Central Government pensioners/ family pensioners Revised rate effective from 01.01.2016. As you are aware, KVS has implemented the recommendations of 7th CPC in terms of GOI, D/o P&PW OM No. 38/37/2016-P&PW(A) dated 04.08.2016, 12,05.2017 & 06.07.2017. In this regard, KVS(HQ) has issued instructions to all the Regional offices/ZIETs for implementation of 7th CPC in all cases of employees retiring with effect from June,2018. Further, they have also been instructed to revise the pension in case of employees retired between 01.01.2016 to 31.05.2018. 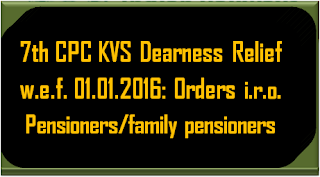 Therefore, you are instructed to make the payment of dearness relief as per the recommendations of 7th CPC in all the cases of pensioners retiring from 01.01.2016 and thereafter where the pension has been revised in terms of 7th CPC. 1. OM No. 42/15/2016- P&PW(G) dated 16 Nov, 2016. 2. OM No. 42/15/2016-P&PW(G) dated 7 Apr, 2017. 3. OM No. 42/15/2016-P&PW(G) dated 28 Sep, 2017. 4. OM No. 42/15/2016-P&PW(G) dated 22 Mar, 2018. It is pertinent to inform you that KVS(HQ} has instructed to all the Regional offices/ZIETs to clearly depict in the PPO that the pension has been revised/calculated in terms of 7th CPC. 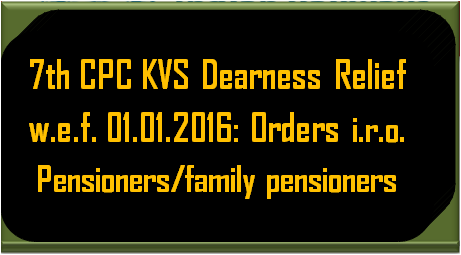 You are, therefore, requested to comply with the aforementioned orders for payment of dearness relief in all cases of Pensioners/family pensioners of Kendriya Vidyalaya Sangathan from 01.01.2016 and thereafter where the pension has been revised in terms of 7th CPC. Payment of dearness relief as per the recommendations of 7th CPC in all the cases of pensioners retiring from 01.01.2016 and thereafter where the pension has been revised in terms of 7th CPC.